Product Description Room Refresher. 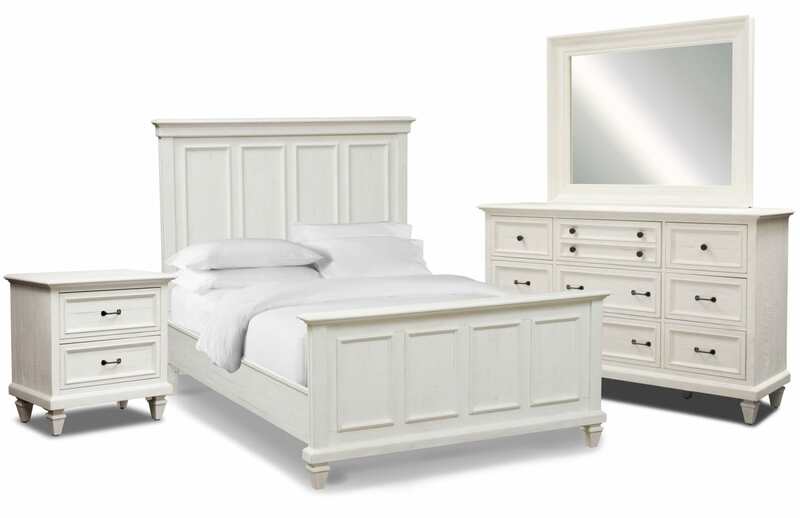 The Harrison 6-piece king bedroom set incorporates natural wood elements with rustic undertones. The vibrant chalk finish is accentuated by a whitewash effect, while contrasting bronze oil knobs and bar hardware enhance the rustic appeal. Tapered wood square feet, inset drawer fronts and crown molding provide intricate detailing while Shaker-style panels on the headboard offer traditional charm. Customer assembly required. Unique Features: Shaker-style panels on the headboard offer traditional charm. Tapered wood square feet, inset drawer fronts, and crown molding provide intricate detailing. The five-panel bed is assembled using bolt on rails and features four slats with support legs.